Show your support for a mentally healthy workplace. Workplace health and safety programs and initiatives have traditionally focused on physical health and the prevention of accidents, illnesses, and injuries. Increasingly, however, organizations realize the importance of promoting the total well-being - physical, psychosocial and mental health - of their workers, and for good reason. Mental health claims are the fastest growing category of disability costs in Canada, and represent a significant health problem in Canadian workplaces across all sectors. 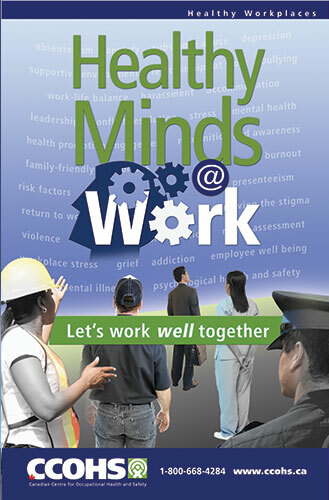 Raise awareness and demonstrate your commitment to creating a psychologically safe and healthy workplace by displaying this "Healthy Minds at Work" poster. For more information on how to improve workplace mental health for everyone, visit the Healthy Minds @ Work website. This collection of online resources can help workplaces increase their understanding and recognition of mental health issues at work, address existing issues, and develop effective approaches to promoting mental health at work. Reinforce your efforts to foster a mentally healthy workplace with “Working Well Together” buttons that your employees can proudly wear.